Note 1: Nick Kalmar & Michael Trajkovski made their debuts for the Western Sydney Wanderers in this match. Note 2: Drawing this match means the Wanderers have not won in 12 games. @Wandererstragic Don't you quote Park Louis Can't Lose to me McWanderer! 5 ins 2 outs 2 2 B omitted - @ALeague will put out later today. But but but that would mean 5 in, 4 out... So need one more out! I just got hit with a massive burst of optimism. Don't know how long it'll last but at this moment I can't conceive of a way we could possibly win by less than 2 goals, let alone lose. We have 2 or 3 games in hand over the rest of the comp, win those and we're in 8th. 6th and 7th are City and Roar, we still have 2 games left against each of those. Then 5th are Sydney, who have 4 long term injuries and with any luck are on the cusp of a meltdown. So this is where we commence a never before seen run of going unbeaten in a calendar year! Ins - NTS, Poljak, Saba, Adeleke & Kalmar. That would do me, as long as it higher than the 14 200 ESFC got against Adelaide last Friday night. Seriously, how bad for them would that look, if us, winless outdrew them when they are coming in the top half of the table. ill say 16,068 68 of these will be mariner fans and mostly the players families. Just a reminder for people that it becomes damn near impossible to find buyers to pass tickets over to when one or more of those seats is a concession ticket. For two games now (including this game) I've been unable to move tickets on as people don't want to take the risk of being challenged for proof at the gate (as small as that risk might be). I can't wait for the formal club buyback/marketplace scheme to begin to take that out of the equation. I've never had to pass on a ticket before so I don't know exactly how it works. Never ever been asked ID or anything like that. Guys - I have a full and a concession membership (for my son). On the ocassions he has not been able to come I have simply asked along freinds and family, ranging from 14 - 63 years of age. That's last season and this and never had an issue. If challenged I am always happy to pay the difference at the scanner but that has never eventuated. I enter via Gate E (i think) Western Terrace & the turnstiles have been upgraded this season. The traffic lights which were situated on top of the previous turnstiles & which indicate the type of pass being used to gain entry to the venue, have been removed. The attendants who man the gates, would not have a clue what type of membership the person entering the ground, has in their possession. I like you have an adult & a concession pass & have never been challenged on the occasions I've entered the venue with a 2nd adult. strbre? no way! weve got him for the first time since **** knows when.... does he even know how to get to the stadium? it's an xmas present from the ffa. fits nicely between the gregorian and julian xmas dates so everyone should be happy. we must win, we will win. Is that the first time this season we get Strebre? 2015 is our year, I can feel it. Happy new year and hope everyone is 1000 happy (khayr) thank you for your support. 1000 happy in Arabic is 'alf khayr'... A common phrase wishing well. 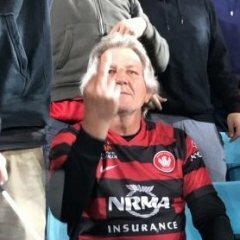 WSW - Unbeaten in 2015.
exactly what i have been rambling on about....good to see popa tell them how it is...i just hope we can start the run from today. To be fair of our new defenders brought in for the ACL, Mullen has been below par, Golec been OK and Hammil has been the find, especially as he is still young for a defender and has genuine pace.